Lyda Krewson thanks supporters at the Probstein Golf Course Clubhouse in Forest Park on Tuesday night. Lyda Krewson poses with attendees at her election night watch party. Lyda Krewson hugs her husband, Mike Owens, after delivering her acceptance speech. Mayor Francis Slay greets attendees at Lyda Krewson's election night watch party. Lyda Krewson dances with relatives, supporters and campaign staff after delivering her acceptance speech. Her victory was expected in the majority-Democrat city and it was greater than her 888-vote win in the seven-way Democratic primary. Krewson won with 67.54 percent of the vote. "As runners say, we ran through the tape tonight," Krewson said. "We shattered a ceiling tonight. And together, we made an historic moment right here in the city of St. Louis." She said she'll begin assembling her mayoral staff Wednesday, but hasn't conducted any interviews yet. She also said that public safety remains her top priority. Krewson had the backing of outgoing Mayor Francis Slay, as well as several other prominent city leaders. 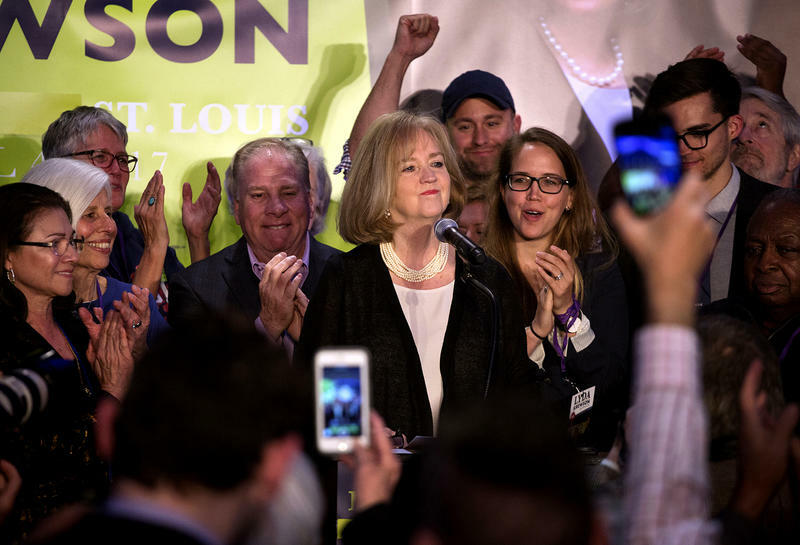 A historical side note: Krewson won the office 130 years to the day that Argonia, Kansas’, Susanna Salter became the first woman to be elected mayor in the United States. The other candidates in the general election were: Johnathan McFarland with the Green Party, Libertarian Robb Cunningham and independents Tyrone Austin and Larry Rice.